3 How to play Amazon Train Of Cards? Hi Guys , Hope You Are Enjoying Our Free Recharge tricks. Now Amazon India Has Comes Up With Another Quiz Time. 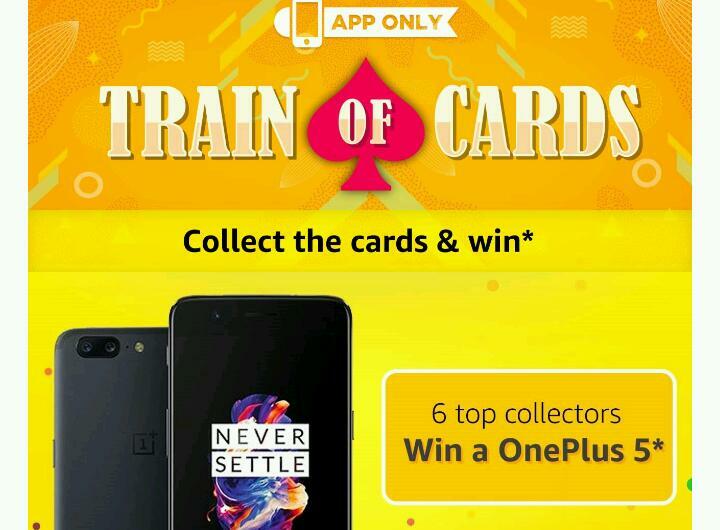 This time not Quiz it’s Game with Train of cards with prizes of Oneplus 5 Smart phone, Amazon pay balance etc. Amazon is Back with new game which is Amazon app train of Cards. In which you have to solve clue and Find product and spot the card. Scroll down to know how to play and Amazon App train of cards answers. Follow the below instructions to play this game! How to play Amazon Train Of Cards? 2. Now Sign in or Make New Account Using Sign Up Option. 6. Then Open The product page, Spot the card and click on it!